Sam here: Today’s post is guest written by the pointster, who writes the Canadian Blog www.creditwalk.ca. (Formerly thepointster.ca). Creditwalk.ca is a resource for Canadian credit cards and travel perks. The pointster has graciously offered to outline a solid booking technique here on Milenomics for both American and Canadian Readers, a little something I like to call the Double Down. This is the second article in a 2 part series on combining multiple trips into a single ANA Award ticket. The first part will focus on the basics of the concept. This 2 part series outlines how to exploit the distance based ANA Award Flights to combine many short trips into a single award redemption, by taking the stopovers ‘at home’. In the first part, I talked about the basics of the concept. In this article, I’ll talk about how to fully exploit whether it makes sense in for you and how to exploit this deal further. When you are looking for award space, use the various tools for finding Star Alliance award space, including United.com and the ANA website. See the first part for further details. Because of the need for clustered airports and short trips, some regions are better than others for exploiting this deal. The best regions are those that have multiple airports that are not co-terminal and have access to Star Alliance flights. While a full list of cities and co-terminal airports is listed below, the double down works best for trips within the Northeast USA, or within California (tiers 1 and 2). This is where you get the real major benefits of 2+ trips for the cost of 1. The other efficient usage is pairing a round-trip cross-country itinerary with a medium length journey. For example, a San Francisco area to Boston roundtrip, combined with a San Francisco area to Houston. You will maximize your gain from this by using up your entire allotment of distance (miles) within the tier you are in. I have put together an Alternate Airport Listing page. I outline what the reasonable alternate airports are for each city and how to access them through public transportation from the major centers. Always bear in mind is that when redeeming ANA miles for any flight, you will be responsible for the taxes and any scam charges fuel surcharges that might be associated with the flights you select. Within North America, Air Canada will charge fuel surcharges, but United Airlines and (while still part of Star Alliance) US Airways will do not. Since the ANA award chart is a distance based char on actual miles flown, including all connections. You will always want to make sure that you are picking the shortest routings. If you end up being sloppy about your routings, you could end up paying thousands of miles more so that you can connect in one airport over another. As you can see, we can either route through Phoenix or Denver. The only difference in the two itineraries is routing back via Denver versus Phoenix. If you notice the number of miles cost has gone up from 22K to 38K. Denver MIGHT be nicer than Phoenix but I certainly wouldn’t pay 16K miles to run across Denver Airport’s terminal instead of running across Phoenix Airport’s terminal. LAX-PHX-ATL-PHX-LAX is 3915 miles flown. One of the rules of the ANA awards is that an itinerary can only stopover in any given city once. However, you are allowed to transit the same city more than once. What this means is that you can transit your home city on your last flight, and simply get out there. 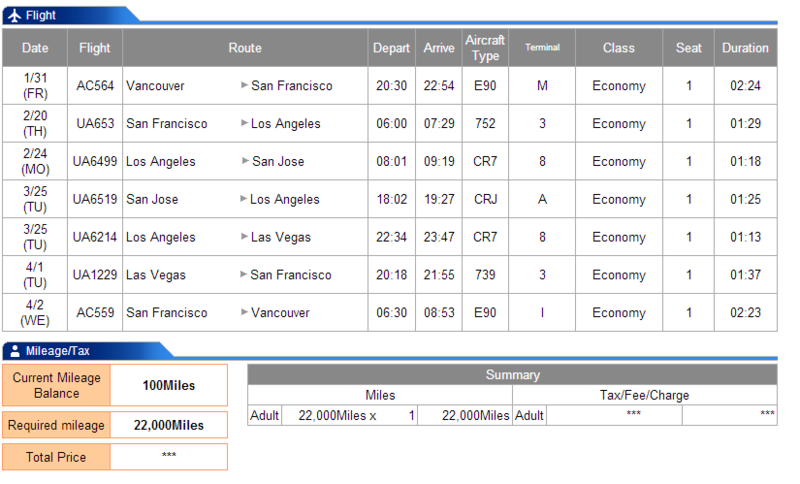 In the example I used earlier, I showed how a San Francisco based flyer can benefit if they are currently in Vancouver. That example implied that the person wanted to go to Vancouver at some point in the future again. In that situation, we needed to get the itinerary to end in Canada, so a final leg needed to be added. Even if the requirement of getting to Canada were not there, we would not have been able to use San Francisco again since it was already used. Routing through San Francisco without using it as a stopover, and using a missed flight, allows us to take further advantage if that is our home airport. Note that once you miss a flight, the entire itinerary is forfeited. Make sure that any “misses” happen at the end of your itinerary and not at the beginning. Something else that you can do with this knowledge is tack on extra unrelated one-way flights. You might have a routing that uses up only 3200 miles of flying. Given that this routing would fall into the tier that covers itineraries of distance 2000 – 4000 miles flown, that would mean you can fly up to 800 miles more without being pushed into a more expensive tier. To do this, it is important to make sure that you never “close” your itinerary by going back to the departure city. From my tests, it looks like going back to the original city kills all future stopovers. Some things to notice here is that Miami is far from both Houston and Chicago. According to the Great Circle Mapper, our routing (MIA-IAH-FLL-ORD-MIA) would end up being 4309 miles flown, which is JUST above the 4000 mile limit for our tier. It probably makes sense to just worry about the return from Chicago at another time. 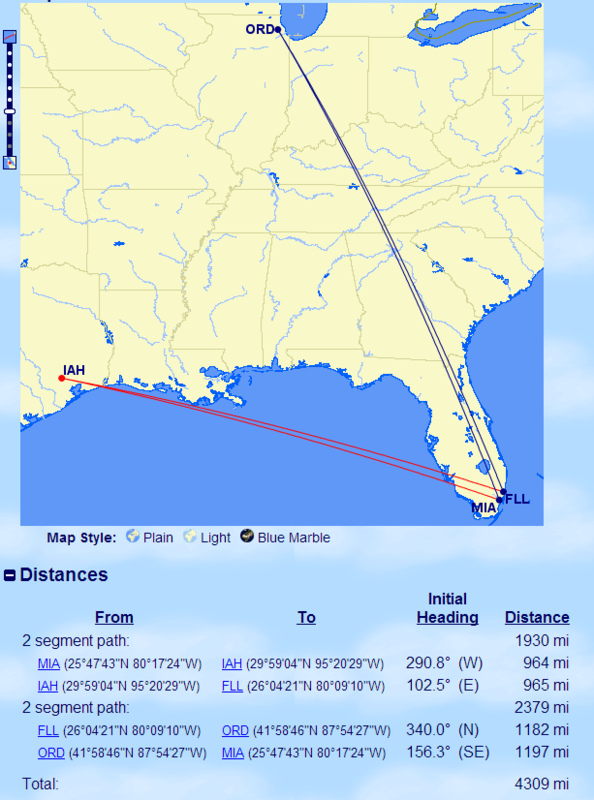 The new routing (MIA-IAH-FLL-ORD) would end up being 3111 miles flown, leaving us about 900 miles that we not using. With those 900 miles, I decided it makes sense to pull a few of my short flights in the summer onto this itinerary. My new itinerary (MIA-IAH-FLL-ORD, LAS-SFO-LAX) comes in at 3863 miles flown, which is still within the same tier as I was before. I basically got my 2 flights (LAS-SFO and SFO-LAX) for free. Don’t let one missing leg deter you from taking advantage of this deal. If you struggle to find space on flights that work for you or that use the ideal routing pattern, it is sometimes worth using another method to get that last leg. For example, if you are in San Francisco and staying in the west, you don’t want to route through Denver to get into San Jose (SJC) airport. What you can do in this situation is create an open-jaw. Simply ignore the leg that is causing you problems. If you are looking to get back into SJC and the only way to access SJC is by spending too many of your distance miles, simply throw out that leg and save your distance miles for more efficient journeys. In this situation, there is a SFO-SEA flight for the initial flight between Seattle and San Francisco, which is only 679 miles flown. The problem occurs when we try to access San Francisco’s alternate airport of San Jose (SJC) from Seattle. The options are either to route through LAX (SEA-LAX-SJC) which would end up costing 1262 miles flown or through DEN (SEA-DEN-SJC) which would cost 1972 miles! 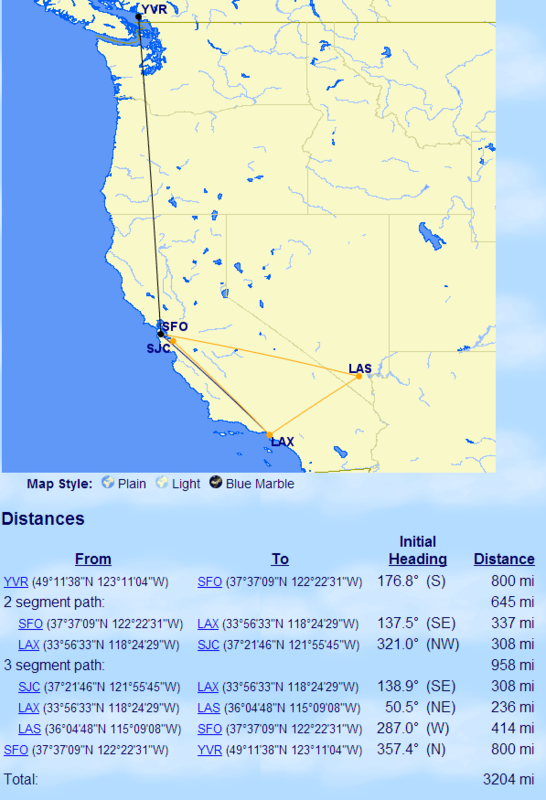 I would suggest ignoring the SEA-SJC leg from this itinerary and use those flight miles much more efficiently. If you have to route via DEN, then this is not going to be a great use. On this journey, you could buy a cheap one-way SEA-SFO using BA miles or paying cash. There are a few ways to get ANA miles. The easiest way, by far is by transferring the miles from the American Express Membership Rewards USA program. The two transfer partners of ANA miles are American Express Membership Rewards USA, and Starwood Preferred Guest. If you are Canadian, your only option will be to transfer SPG points. If you are American, there are many credit cards that will earn you lots of American Express Membership Rewards . There are a lot of articles on this Milenomics site that talk about how to efficiently accrue Membership Rewards. FNBO also offers a specific ANA miles credit card. This card has a $70 annual fee and earns 1 mile / dollar on all spending. Given the ability to get fee waivers and great category bonuses from American Express, I think the FNBO ANA card is a comparably weaker offering . Similar to all of the other frequent flyer programs, you can earn miles by flying. Personally, I would rather earn United miles for my Star Alliance flying. If you are unable to earn ANA miles through American Express Membership Rewards USA, then this is not a bad option. If you are Canadian, then earning miles through flying might not be a bad idea. If you are earning Aeroplan miles currently, I think that ANA miles are probably more valuable than Aeroplan miles. I think that United miles are more valuable than both, but you have to figure out if this trick works for you. The best cities for exploiting the double down are Washington DC, San Francisco, Chicago, Philadelphia, Miami, Los Angeles, Boston, Toronto and Vancouver. Getting ANA miles in North America is best achieved as a transfer partner of American Express Membership Rewards (USA). Canadians who want to take advantage of this deal can transfer miles from Starwood Preferred Guest to ANA. Sam here: I want to thank the pointster for stopping by Milenomics and agreeing to share his tips on the ANA program. We’ll discuss the Double Down more here on Milenomics, and I’ll be adding it to my award tool belt as well in the coming months. (no close in booking fees!). Whether this booking trick works for you depends on a combination of where you want to go, and what airports you have at your disposal. Keep this in mind whenever you’re flying where avios can’t take you, or whenever the savings is there. This also opens you up to Star Alliance availability. Whenever possible, Double Down, and use it to save money and miles. One that I thought of that you didn’t seem to mention that I thought you might (especially given the name of Double Down) was nesting 2 ANA trips inside each other (or overlapping), with the idea of alternating which of the 2 adjacent airports you’re at (so as to avoid starting in one airport and returning to another. 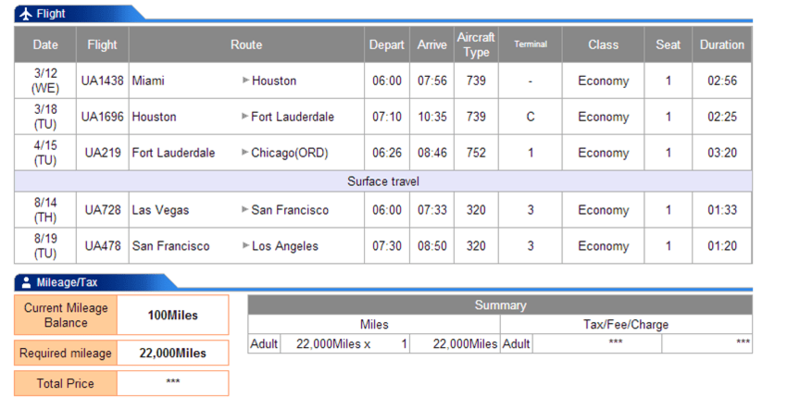 You’ll see that this 2nd trip matches up with the first one, giving 4 roundtrip tickets for 34K (or 40K) miles. Now, the downside of this is that I couldn’t quite get that 2nd trip to price out without violating the ANA stopover rules – in this case it’s complaining that I’m starting in ORD and later using ORD as a stopover. I tried monkeying with it a bit but couldn’t get it in the time I had. It seems like something along these lines would work though. What am I missing? Which of those doesn’t count as the stopover since as I understand you can only have 4? I have to try to digest your idea of nesting trips in there. Once I try to figure it out, I might put in an update. Thanks for the tip! In terms of the number of stopovers, I am only going to guess as to why ANA approves this. I believe that it is calling your last leg the flight to the destination. Even though we have added a different airport in there. 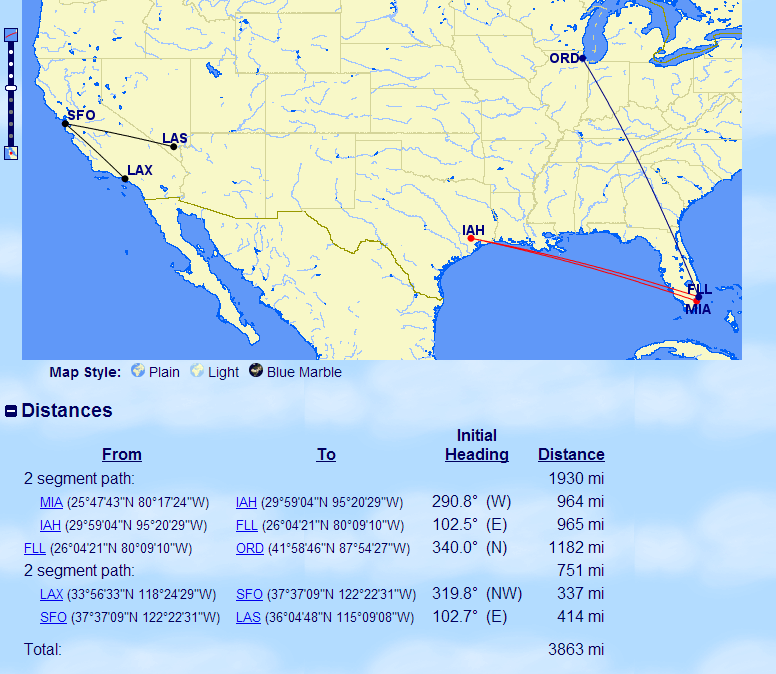 I don`t think we can nest that LAX-SFO, SFO-LAS in between IAH-FLL, FLL-ORD. My guess is that the final run makes LAS the destination and doesnt count it as a stopover. I dunno. It seems like in all other situations, the destination counts as one of your (4 allowed) stopovers. Maybe they don’t count the open jaw between ORD and LAX as a stopover? I tried a few other combinations trying to double up some of the airports, trying to figure out what counts as a stopover and what does not, but was not able to double anything up. What I am thinking is, ANA’s routing rules and price system is similar to United’s. For example. United says you can have two open-jaws and one stopover on certain round trip tickets. That is very vague definition. And as long as you can price the ticket on line or through the call center, the routing is valid. I would say ANA works in same manner. As long as you can price out the ticket, it is. Otherwise, forget it. Andy: A Big issue for me with a lot of the award programs are that there really aren’t “rulebooks.” Whatever you can book, and ticket, is valid–regardless of the rules. That cuts both ways, for the 2x OJ and a stopover with UA there’s a rule somewhere that the stopover can’t be in your origin city if you use the OJ. Why? I have no idea and most UA phone agents don’t either. I’ve called ANA before and their phone agents are good, but I wouldn’t waste your time calling. ANA’s website is complicated, but allows really complex bookings like these to be done 100% online, something I can’t say the same for United. Oh, and have you tried ANA’s call center? Maybe there’ll be surprise, who knows. Love it – awesome post! This post is all the more important now that april 12th is fast approaching. Ed: Using the techniques in this post your stopovers are not limited to 4/24hrs. and can be “real” stops. You can stop in a city for days/weeks so long as you follow the rest of the rules and don’t double back to your origin. You’re right that this is important more now than ever. In a few days this will no longer work.